On November 28, 2010, Wikileaks began publishing 251,287 leaked United States embassy cables of classified documents from U.S. embassies around the world. The subject of the OHB statement was an October 22, 2009 diplomatic cable purportedly recounting a meeting on October 2 between Smutny and economic officials at the U.S. embassy in Berlin. On Thursday (January 13, 2011) the Norwegian daily “Aftenposten,” which has gained access to the WikiLeaks documents and is reviewing and posting a selection of them, published the embassy wire on its website. Smutney joined OHB-System on July 1, 2009. Indeed, in December 2009, OHB-System won the bid for the full operational capability (FOC) Galileo spacecraft in a reversal of fortunes for EADS Astrium, which had the contract to build the in-orbit validation (IOV) version. On January 26, 2010, Smutny signed the first work order covering the manufacture of 14 satellites, with delivery of the first satellite set for July 2012, followed by two satellites every three months. The dispatch was identified as coming from “Murphy,” presumably U.S. Ambassador Philip Murphy, who in December was criticized for his alleged comments in WikiLeaks documents by parliamentary representatives of the Free Democratic Party (FDP), the junior party in Germany’s ruling coalition. The cable was classified as “confidential” by Acting Global Affairs Unit Chief David L. Fisher for reasons 1.4 (b) and 1.4 (d). These, according to the agency’s Foreign Affairs Handbook on State Department terms, concerns “foreign government information” and “foreign relations or foreign activities of the United States, including confidential sources,” respectively. Among State Department officials copied on the Berlin embassy message was David Turner, deputy director of the Office Space and Advanced Technology, who is well-known in the GNSS community. According to the embassy note, Smutny criticized French interests for aggressively corralling EU support for Galileo, adding, “Smutny said no matter how much the French would like Galileo to be built International Traffic in Arms Regulation (ITAR)-free, this is highly unlikely given that there are not sufficient replacements for some radiation-hardened US ITAR-controlled components that Galileo will need. In Fuchs’ statement on the OHB-System website, the company’s chairman said, “I wish to stress that we maintain excellent relations with all French institutions and companies in the French aerospace industry out of conviction. I personally have numerous close friendships with representatives of the French space sector. In addition, I would like to expressly emphasize that the OHB Group and the Fuchs family have always unreservedly been proponents of the “Galileo” project initiated by the EU. 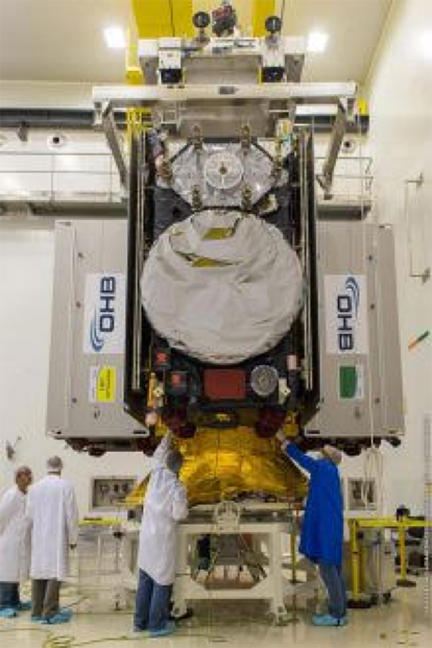 In fact, OHB’s success in the GNSS field was undoubtedly aided by the presence of Paris-based Alain Bories, OHB Technology senior vice-president for strategy and business developmen, who joined the company in 2006 from France’s Thales Group where he was a vice-president deeply involved with that company’s Galileo activities.